Before we go on to learn from what happened in 1970-1973 (as you will see, the parallels are uncanny) let’s get up to date with what is happening this week. The bottom line is, that as in the early 1970’s, the EU is playing hardball and the UK’s political class are largely caving in and deceiving the British people. Theresa May has (I suspect through weakness and incompetence rather than malevolence) managed to come up with a deal that is so bad for the UK that the EU Commissioners took just minutes to sign off on it, barely able to conceal their glee. She has left the House of Commons with the choice of a bad deal or no deal. The House of Commons which voted over 75% Remain will bind itself not to have no deal, which in reality means that there will be no Brexit – because the EU does not need to, and will never, offer a good deal. They know that they can keep the UK in their project forever and force us to pay for it and to obey all their laws. The self-styled Peoples Vote is not a Peoples Vote at all (we already had that). It is unashamedly a ‘lets stay in the EU at all costs’ vote. Our political classes are acting as EU stooges (for which they are well rewarded) to maintain the traditional EU policy of never accepting a referendum result they don’t like and compelling people to keep voting (under ever-increasing threats and Project Fear manipulation) until ‘the People’ get the right result. And please don’t be fooled by the propaganda which goes on about this is ‘parliament taking control – isn’t that what you voted for?’ This is about politicians seeking to make null and void the largest democratic vote in UK history by claiming to take back ‘sovereignty’ only to then propose to hand that sovereignty back to the EU Commissioners. All of course in the name of ‘the people’ in much the way same as dictators everywhere claim they are acting in the name of the people. This has of course happened before as we will find out in looking at chapter 9 of The Great Deception, to which we now turn. “There are some in this country who fear that in going into Europe we shall in some way sacrifice independence and sovereignty. These fears, I need hardly say, are completely unjustified.” Edward Heath, prime ministerial TV broadcast, January 1973. In April 1970 a Gallup poll showed that only 15% of British people were in favour of joining the common market. In the 1970 general election there was almost no mention of joining the common market and yet within two weeks of being elected Edward Heath began Britain’s negotiations for entry which we then join, without any referendum in 1973. There were now 13,000 pages of EEC laws. Heath’s position was simple “swallow it whole, and swallow it now”. Joining the EEC was going to cost Britain a great deal of money – mainly to fund the CAP, which was 91% of the £3 billion budget. Heath knew this as did Geoffrey Rippon, his chief negotiator. But they knew that this would not be acceptable in Britain so they asked that it would be done on a step-by-step approach so that people in Britain could be “reassured that their fears were unjustified”. Booker and North’s account of the discussion process is fascinating, but far too much for me to put down here. Suffice it to say that it involved a great deal of stage managing, claims of “significant progress” and a great deal of deceit. Heath knew that Europe was moving towards monetary and political union, and privately agreed that Britain would aim for the same. The negotiations were “successful”. The cost to Britain was enormous – we had to spend as much on funding the enormously expensive CAP as the Americans spend on reaching the moon. CAP itself was to prove tremendously damaging to British agriculture. In effect we were paying a fortune to destroy our own agricultural industry! We also damaged the Commonwealth and many poorer countries. The claim was made that membership of the community “would mean that British manufacturers will be selling their products in a home market five times as large as a present”. There was no mention of the fact that continental competitors would be just as free to sell their products in the British market. There was also no mention of economic and monetary union or loss of national identity. The now familiar claim was made “there is no question of Britain losing essential national sovereignty; what is proposed as a sharing and enlargement individual national sovereignty is any economic interest.” Even as they signed this agreement the British government knew that this was a lie. People are wondering why fishing is so important in the current attempt to leave the EU. It is because of this shameful episode as we entered it. An episode so shameful that much of it was kept secret for three decades.The British people were again made a promise by the politicians (sound familiar?!). 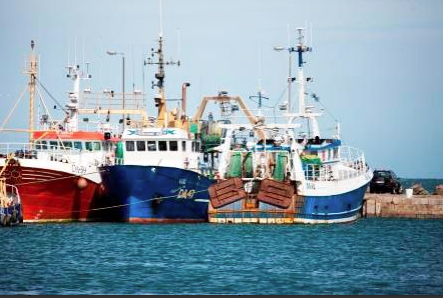 The government’s White Paper stated that “the community has recognised the need to change its fisheries policy”. Not for the first time, and not for the last time, the British public was being seriously misled..(incidentally it is ironic that out of this betrayal of the Scottish fishing industry the SNP grew its support, but now that same SNP has signed up to the great betrayal – for all it moans about Theresa May’s policy (to use fishing as a bargaining tool in future economic negotiations) there’s is worse. They want to join the EU, which means joining the CFP and handing control of Scottish fishing waters over to Brussels. The hypocrisy is breathtaking – although some SNP supporters are so of the view that neither their government nor the EU can do any wrong that they seem to genuinely believe that it makes sense to claim that your policy is to belong to the EU but not the CFP…of course others just don’t care about fishing and are quite happy to see it traded for their fantasy Nirvana!). Heath now began a massive publicity campaign on the merits of entry – not so much seeking to convince the public but rather seeking to convince members of Parliament that the tide of public opinion was moving in favour of joining the EEC. (Note the same tactic being used by the so-called ‘People’s Vote campaign currently). Another tactic which has become very familiar is that the pro-EEC lobby groups were coordinated under the umbrella of the European movement, part funded by the European commission, to act as an integral part of the government campaign. Government information services, funded by taxpayers, thus coordinated activities with the trade union committee for Europe, the Conservative political Centre, the Labour committee for Europe, CBI and many other organisations, including the National farmers Union, the associated Chambers of Commerce, and the British Council of Churches. Plus ca change plus c’est la meme chose. Another very familiar aspect was a carefully organised campaign based on letters to The Times, then regarded as Britain’s most influential newspaper. Pre-written letters were circulated to be signed by top name individuals or groups of businessman to be sent in as if they were the signatories on work. Particular efforts were made to woo the BBC. the European movement disperse more than £550,000, more than five times its normal budget – all of this came from unnamed donors. no attempt was made to the public objective or. factual information. Research was done to find out what people wanted to and then used to shape the campaign. The House of Commons with the support of 69 Labour rebels voted by a majority of 112 to join the EEC. Now came the great Fisheries betrayal. After protracted negotiations, Geoffrey Rippon told the House of Commons “it is clear that we retain full jurisdiction of the whole of our coastal waters up to 12 miles”. The government lied. In effect they gave away all British fishing waters, up to 200 miles to control of the EEC. The world’s richest fishing waters had been signed away for nothing. The Norwegian people were not so stupid – their fisheries minister resigned and on 25 September 1972, the Norwegian people rejected entry in a referendum by 52.7% to 47.3. At least they were offered a referendum. We were lied to and we never got a say. The incredible thing is that the UK Parliament hadn’t even seen the treaty that Edward Heath would be signing on our behalf. The biggest change, which went largely unnoticed and unchallenged, was that unprecedented powers were to be placed in the hands of unelected officials, both in Brussels and Whitehall, who are now in effect been given the right to make laws with only a semblance of democratic accountability. The Labour leader Harold Wilson, was entirely opposed to this handover of power, but most of the conservative anti-marketeers voted with the government because they feared that the government would fall (again sound familiar?). Heath’s government won by 390 to 301. The government still looked to be in trouble. But they got through it thanks to a secret arrangement between the Conservative whips and Labour pro-marketeers. A story which only came to light 20 years later. As Shirley Williams testified “People disappeared. They went to the films, they just didn’t show up, and so forth”. The Labour whip guaranteed that they would be just enough Labour abstentions to guarantee a government win in every vote. (In my view the same thing is happening in the House of Commons – and Lords, today). The Australian points out that May’s Brexit capitulation is bad for trade deals with the likes of Australia. Yanis Varoufakis, insightful as ever, point out in this article in The New Statesman, that the EU declared war and Theresa may meekly surrendered. I’m not a big fan of conspiracy theorists, but given what we have read above, this claim from Patrick O’Flynn MEP, makes a lot of sense. This wee video clip of Guy Verhofsdadt summarises where the EU is going (and has always been going – handing over national sovereignty to the centralised unelected technocrats). Finally this article from The Spectator deals with the Project Fear myths which are becoming increasingly hysterical and alarmist. I suppose if we confiscated all the existing fishing permits, the new UK holders could always sell them to foreign megafirms again – as they did the first time. Whatever one thinks of the system or its origins, or chooses to change, that needs addressing if the home industries are really to be helped. Also, a Parliament that is only sovereign when you or I like it is no Parliament at all, and might as well be closed down. We either vote for representatives to do the governing, or we go over to government by plebiscite – you can’t have both, since (as now) neither will accept the decisions of the other. It’s odd, a bit weird. Yesterday, I’d heard that someone from the ECJ passed an opinion, not binding) that the UK would be able to unilaterally leave the backstop. Evidently, on Monday the ECJ, is going to made a decision, pronouncement on the matter. I don’t know how or who has made a referral to the ECJ, or why they’d be involved at this stage. Who are the parties to the proceedings? Is the UK represented, or is the Commission, in effect seeking legal clarification, as did the Prime Minister, from the Attorney General or whether it is an ECJ judicial review of the deal, but again who has made the referral. I’d not be surprised that the ECJ would pass a non legally binding opinion, in effect obiter dictum, that the UK could leave unilaterally. But as is the way, the decision is less likely to be so straightforward as I’ve put it. And there’d be next to no time to properly consider it before Tuesday’s parliamentary vote. But, an ECJ decision in this manner could save face all round and push the deal through.. The next day, Tuesday, Parliament will vote….in favour of the deal? Geoff, I don’t think that’s right. Unless I’ve missed something, the non-binding ECJ Opinion was that the UK would be able unilaterally to withdraw its Article 50 notification to leave the EU within two years. As that notification was given on 29 March 2017 (a couple of months before Mrs. May’s disastrous general election call), the clock started ticking at that point. The UK can’t unilaterally decide to withdraw from the backstop as the Withdrawal Agreement is an international treaty, subject only to parliamentary validation. We know how punctilious the UK is about observing its actual international obligations by observing how punctilious it is about observing invented international obligations such as (a) the payment of a “divorce bill” of £39 billion to the EU (a figure which has never been properly calculated or costed) to cover future commitments, despite the fact that the UK has been a net contributor; and (b) the securing of an open border in Ireland which is supposedly an imperative of the 1998 Belfast Agreement. To secure this outcome the UK government is willing to contemplate an internal UK regulatory and even customs border cutting off N. Ireland from its main export market, and ensuring that N. Ireland companies will never get the benefit of any trade deals that are going. It is unheard of for a sovereign nation to behave in this way. It’s probably also incompatible with the Act of Union of 1801. In several of Swift’s pamphlets in the 1720s he was lambasting the London government for imposing additional import duties on Irish wool. Nothing much has changed. Imagine Donald Trump negotiating a trade deal with Canada whereby Vermont would be within the Canadian customs and regulatory zone. Thank you. I wasn’t sure. I’d heard on BBC radio 4 twice while driving, on different days what I took to be a similar point- that the UK could unilaterally leave the backstop. I’d thought that Art 50 was evidence of that we could by giving notice, so why would the opinion of an ECJ judge, at this particular junction have any relevance that would be worthy of report. But it makes sense if it related to a unilateral withdrawal of Art 50. It seems that the ECJ is going to be making as decision on Monday next, but I’ve not heard or read anything more, so can only wait and see. If it was what I took it to be, surely there’d have been much more significant reporting and consideration given to it. The remain cohort doesn’t seem to have emphasised the point. But, no doubt it is a card yet to be played. What struck me, notwithstanding his depth of knowledge, was the detached intellectual demeanour, far from the commitment which brought out voters in such numbers for the referendum. I’ve mentioned this before, but I’ve not seen or heard anywhere the point that a key principle of the Sovereignty of Parliament, is that Parliament, can not t not bind successive Parliaments. But the backstop, does precisely that. It is irreversible, by the UK Parliament alone, not even an Art 50, termination clause. I’ve not studied international law, but surely any treaty, properly drawn would/should contain termination provisions, not only for breach of treaty. Geoff, yes, I understand your puzzlement. Nothing here makes much sense. You’re quite right that Parliament can’t bind its successors, but there is maybe a difference when it comes to international treaties. In the past the British state has been capricious to say the least in its decisions about which treaties to observe and which to ignore. So have other states. But once the British state ratifies this one there will be no going back. We will be informed loftily and repeatedly that we are a nation that honours its commitments. The £39 billion will be gone and we will be left pleading with our bosses in the EU Commission not to take the full advantage of us which the Withdrawal Agreement give it. The ECA of 1972 was the logical outworking of our accession to the old EEC. It was more than a treaty because it made it clear that in any conflict between domestic UK law and EEC law the latter must always have precedence. This made it awkward because (unlike the US constitution for example) there was no clear demarcation made between state and federal competencies. Eurosceptics have always shied away from the idea of a federal Europe, but actually a federal Europe, while objectionable in many ways, wouldn’t be as bad as the juridical alphabet soup made up of UK law, EU law and ECHR law which we have had to suffer for so long. The ECA as I understand it has been repealed and the applicable EU law reapplied as part of our own law. Like you, I’m amazed by the insouciance of the so-called constitutional experts (step forward Dominic Grieve!) who routinely misrepresent the constitutional position in their efforts to assert some kind of Parliamentary prerogative that owes nothing to the people, but is sort of suspended above us in mid air. Parliament used to assert its authority over against arbitrary power and privilege. Now the idea seems to be that Parliament should assert itself against the people it’s supposed to represent, which is a different kettle of fish. It’s an odd kind of respect for Parliament because Grieve and Co. seem to think that Parliament should stick up for itself but only against the people, with the ultimate aim of bringing Parliament back into the servile rule-taking role it had from 1973 until this year, tugging its collective forelock to the EU Commission. 1. I voted in the 1970’s stay out, having studied Constitutional and Administrative law as part of an LL.B, based on ceding Sovereignty in our uncodified system and the different principles of applying to canons of statutory interpretation and judicial precedent. 2 I was unaware of all that David has written about in this series, but I was aware of coherent and cogent and committed voices against, such as Peter Walker and Tony Benn. I can’t think of anyone today who speak with such alacrity. David has, in the past, linked some of their speeches . 3 Dominic Greive, in the first part of yesterday’s radio 4 programme (above) was interviewed over his amendment. He and others had secured funds to employ a researcher, to delve into the Constitution and parliamentary practice, into Erskine May. 4 The Lord Butler interview, followed on separately. He said that anything parliament proposed under the amendment would be advisory only, not obligatory on the Government. If the Executive did not accede, it could lead to a no confidence vote, which wouldn’t pass particularly as the DUP would not vote against the Government. It would then come down to whether May resigns or is ousted (which would take time due to Conservative Part processes, when it was thought that a number would have their hat in the ring). 5 I’m unsure whether MP’s or the media are aware that Greive’s amendment would only result in Parliamentary advisories, though much would be made of it, if the Government didn’t take the advice. 6 We’d be left with the nonsensical idea of negotiations by Parliament, if it were otherwise. 7 There are many, on both sides, who assert Parliamentary Sovereignty and the common good (the right thing), when fear and self interest are their ultimate drivers. AND they and we need to be reminded that they only had ONE vote in the referendum. 8 But I’m one of those regularly and vociferously derided as ignorant, past my voting franchise age. Geoff, I will run with all this, though I must confess that the parliamentary shenanigans don’t interest me all that much. The Grieve amendment certainly has no legal force: he’s hoping that it has a moral force behind it. Looking at the mechanics of it, I can see no reason why the House of Commons can’t reject this Withdrawal Agreement but stop short of a vote of no confidence. Lack of support for a particular measure doesn’t have to extend to loss of confidence in the Government as a whole. I think as well, though I’m not sure, that the Fixed Term Parliaments Act (FTPA) can be set aside only on a two thirds vote. That was how TM got her election in 2017. Labour had to be seen to want a dissolution of Parliament as well, which turned out to be not too bad for them in the event. That kind of majority would mean a lot of Tories voting like turkeys for what many believe will be an early Christmas. The subsequent election may, possibly, result in a Corbyn government and the typical Tory MP doesn’t want to take that risk. So, the most likely outcome may be resignation by TM and a quick change of leadership whereby some anodyne figure supported by the MPs but not the public (not Boris Johnson) will take over. If he or she were prepared to tough it out we could get past 29 March and on to the sunlit uplands of WTO exit. But there are too many Tories (let alone the Opposition) who will stop at nothing either to prevent the UK from honouring the People’s Vote of 2016, or to dilute it so that it becomes absolutely meaningless. The idea of the UK actually making a go of life in the big wide world outside the EU is like wormwood to them. What lies behind this fanatical mindset is anybody’s guess. I congratulate you on having seen some things in 1975 that made up your mind to vote to leave the EEC at that time. I was only 16 then, but I fear I might not have been as farsighted. The leading rejectionist voices back then were Enoch Powell, Tony Benn, a Conservative guy called Neil Marten I think, all viewed as mavericks, and the admirable Labour heavyweight Peter Shore, whom I heard speaking at the Cambridge Union a year or two later, and was mightily impressed. I suppose I wouldn’t have agreed with him on every subject, but a man of integrity and real (not synthetic) passion. There were giants in the land in those days. Now we have it. The ECJ has ruled we can unilaterally ,withdraw the withdrawal, without affecting the present terms of membership, and at the same time there’s an announcement that there will be no more negotiation. And the meaningful vote tomorrow? Indeed. The meaningful vote which the Remainers plotted and litigated to achieve has been shelved. The attempted renegotiation of the Terms, which had been categorically ruled out, is now going to happen. The government will come back with some form of words designed to lull the opposers back into quiescence. But the Treaty will still be the same unless it’s amended, and I somehow can’t see that happening. So the vote still won’t pass. The ECJ decision is significant, because the establishment in the UK will see that as a way back. This will be a coup by Parliament against the people. The big battalions in the country have always hated the thought of leaving the embrace of the EU. Now they see the chance to get back without even going to the trouble of consulting the people again. The clamour for a so-called People’s Vote may die down. I’m just hoping that the chaos at Westminster will persist long enough to get us over the line on 29 March on WTO terms. It does take a while to reverse legislation that has been enacted. What worries me is that the ruling class may find some way of putting the legislation on hold while they act to neutralise it. 2 The significance of the timing of the pronouncement of ECJ ruling was either lost or avoided until I heard James Mates on ITV News at Ten,reporting from Strasbourg, I think, say that it was “no accident”. Today on the same 1pm radio 4 programme Ken Clarke, introduce as “Father of the House,” concluded that it is now reduced to either a Parliamentary vote on 1 a No deal Brexit or 2 a revocation of the withdrawal, particularly as there would be no movement at all by the EU on the terms of backstop. A Dutch MEP was also interviewed. He said the backstop was UK government idea, not the EU. 3 While the EU say they are seeking to “protect”a member State, Ireland, at the same time they are seeking to interfere with the Sovereign Union State, to separate. It is a separatist movement the EU would not countenance in Spain.